A pal, Terry Whiffin, has just returned from a holiday in France with his wife Pauline, they were using their MGB for transport. When we saw him following his return the boot lid of his immaculate MGB was looking a bit worse for wear. The story, which unfolded, is a timely warning for us all. When they arrived at the holiday location after the long drive down to Montignac, 35 miles southeast of Bordeaux, Pauline went inside leaving Terry to unload the car. Unfortunately the boot would not open, no matter how he tried it proved impossible. 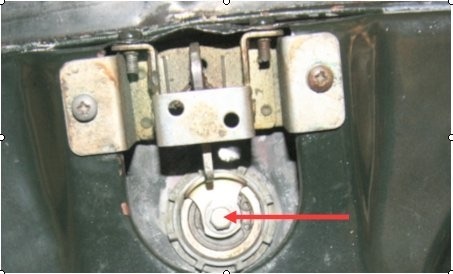 It transpired that the bolt on the underside of the boot lock (see picture) had worked loose allowing the catch plate to move causing it to no longer make contact with the unlock mechanism. With this bolt missing there is simply no way that the boot can be opened and all their luggage was still in the boot. “Don’t panic,” said Terry there must be a way. It so happened that the owner of the hotel had a well-equipped workshop. After numerous tries with WD40 and a hammer and lots of head scratching, the problem was eventually solved by using an angle grinder. The lock was cut in three places and removed, causing some damage to the boot lid, resulting in a hefty repair bill for boot lid once back in the UK. The warning therefore is to regularly make sure that this tiny insignificant bolt is tight – you have been warned.